Decoupling of biogeochemical cycles: will we be able to face this challenge? Biogeochemical cycles comprise a sequence of events where chemicals or molecules move through the ecosystem, they include cycles for carbon, oxygen, nitrogen, phosphorus, sulphur, and water that are essential to sustain life on Earth. Human activities, however, have strongly impacted these natural pathways. For example, the rise of CO2 levels in the atmosphere has led to an acidification of the oceans, disrupting the natural order of ocean life, interrupting the food web and compromising water supplies, among other negative effects. The excessive application of nitrogen fertilisers to agricultural land in order to increase crop production has led to a “hyper-fertilisation” of the soils, dangerously reducing the amount of fertile ground available to feed an exponentially growing human population. The phosphorus cycle is being impacted as we move the available phosphates from concentrated sources (mines) to the bottom of several water bodies, lakes, seas and oceans, and it will be a matter of millions of years before they become available again. Finally, we have been and still are polluting fresh water sources, which are already a small portion of the available water in the earth (most of it is in fact saline water) and consumption is increasingly exceeding uncontaminated supply. The decoupling of these cycles is far from being sustainable; the current usage of resources, water, land and nutrients following a linear economic model of ‘take, use and dispose’ cannot be considered as a long lasting strategy for the survival and development of life species in the planet, including humans. 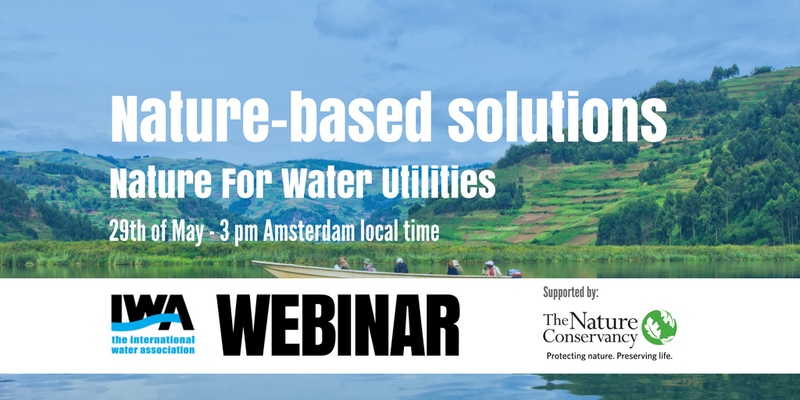 How Sanitation and Nature Based Solutions (NBS) can interact? Sanitation, which is the management of human excreta, is closely linked to biogeochemical cycles. Carbon is one of the main components of faecal matter and is also contained in appreciable percentages in urine and in the common greywater contaminants. The treatment of wastewater to completely remove organic matter is highly energy intensive, producing CO2 as a result, and thus contributing to global greenhouse gas emissions that are driving climate change. Carbon in soil is essential to healthy soils; however the level of carbon is often depleted due to intensive agricultural practices. Carbon also supports the denitrification process which becomes even more important with accumulating nitrates from fertilisers. Thus the lack of carbon has impacts also on the nitrogen cycle. We are investing about two-thirds of the industrial cost for wastewater treatment to convert nitrogen from one form to another. Specifically this means oxidising ammonia to nitrates and then reducing the nitrates to the stable gaseous N2 molecule, using the atmosphere as sink of this precious nutrient. Then N2 is reduced again to ammonia by the Haber-Bosch reaction (a highly energy consuming reaction) to produce fertilisers needed for food production. The nitrogen cycle in wastewater treatment and fertiliser production. Source: Rodriguez Arredondo, M & Kuntke, Philipp & Jeremiasse, Adriaan & Sleutels, Tom & Buisman, Cees & Heijne, Annemiek. (2015). 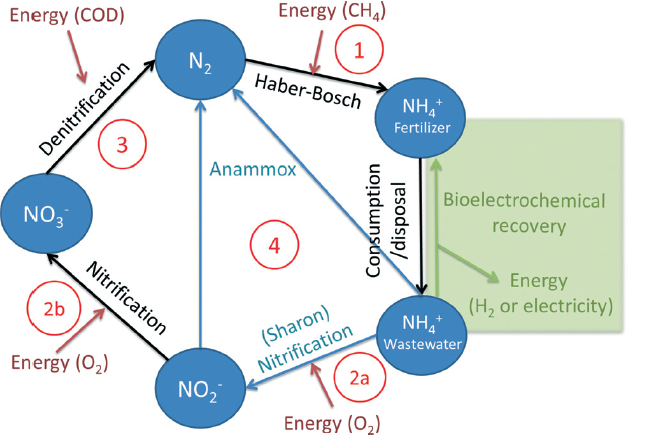 Bioelectrochemical systems for nitrogen removal and recovery from wastewater. Environmental Science: Water Research & Technology. Why is so much energy and money used to convert the ammonia in urine through the nitrogen cycle back to ammonia for use in fertilisers? Do we really have to mix all sort of contaminants and “good substances” to process them all together at the end of the pipe? Shouldn’t we transform our perspective on wastewater management from a “flush and forget” model to a more sustainable circular model? A starting point could be to look at wastewater as a carrier of valuable primary chemicals that can be easily converted to marketable products – fertilisers, bio-plastics, soil conditioners, biofuels-, as well as a relevant source of “new water” to be used for specific purposes. Attention should also be given to all the technologies that are able to lower wastewater treatment costs, while still maintaining reliable and robust performances in the long term. In both cases, nature based solutions emerge as a promising concept to reduce costs, optimise resources efficiency, and reduce the carbon footprint. Water utilities, working in close cooperation with urban planners, should therefore convert the commonly adopted end-of-pipe and centralised concept of sanitation to a wiser and sustainable one, which includes NBS as fundamental elements for the recovery of resources as “new water” (recycling and reuse) and nutrients (carbon, nitrogen and phosphorus). It is possible to design NBS as an integrated part of a park or garden, up on walls, inside of buildings or on their roofs. Beside the particular treatment aimed at, wetlands can provide a variety of other vital ecosystem functions, some of which are wildlife habitat, evapotranspiration and thus urban heat cooling, water storage and management, recreation, landscaping, green in the built environment. Current centralised vs. future decentralised and NBS based concepts for urban sanitation. Source: F.Masi, A.Rizzo, M.Regelsberger (2018). The role of constructed wetlands in a new circular economy, resource oriented, and ecosystem services paradigm. Journal of Environmental Management. The table below outlines some of the benefits and co-benefits to consider when designing NBS. 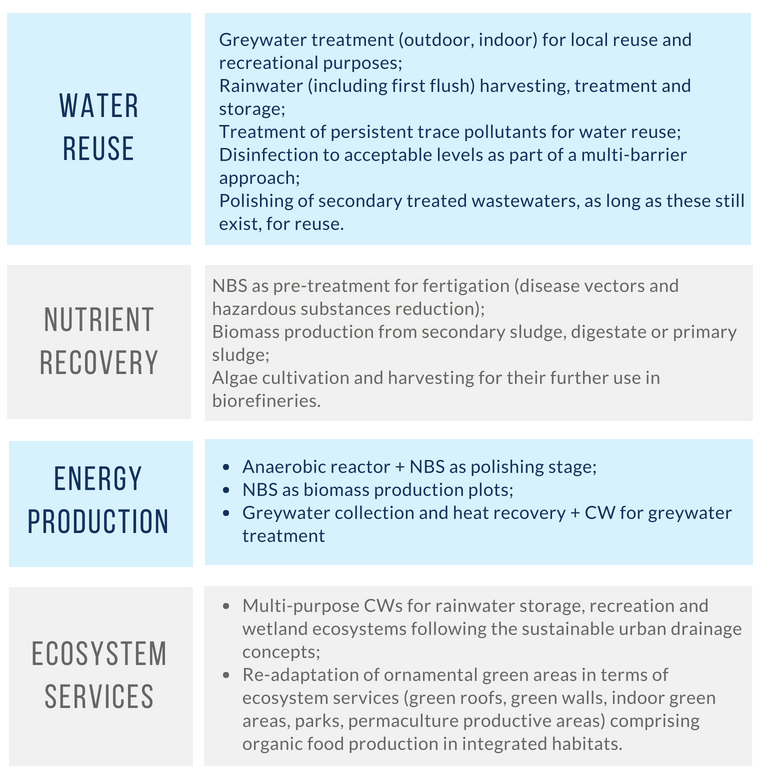 The integration of NBS in urban areas is expanding, even more so if the concept of “retention” is not only thought in terms of flood risk reduction, but also considers the trapping of nutrients and organic compounds, as well as emergent substances of concern, which are mutagens and carcinogens with effect on both aquatic organisms and humans. The water sector involves a large spectrum of competences to achieve the multiple purposes of such installations, from increasing the “sponge” capacity of a city, to locally raising the biodiversity and the presence of wildlife, working as a last buffer and interface between settlements and water bodies (i.e. adsorbing POPs), creating enjoyable spaces and fruition opportunities, mitigating air pollution and adapting cities to climate change challenges. The NBS concept should therefore become a basic strategy in every urban planning procedure, inserting multi-purpose green and blue infrastructures in a diffuse way in our cities. NBS are flexible, can be integrated almost everywhere, need little maintenance and have low operation cost.  The economy of scale is not very high, which facilitates building them in different sizes. A strong cultural transition is still needed to achieve the integrated and comprehensive water management approach shown in the infographic, but the multiple benefits offered by NBS to our resources challenges is a no-brainer. Said all this, what are we waiting for?  Go for Nature, go Green, go for NBS in every country and in every city! Sign up for this webinar to learn more! Download the image and share on social media!